Many scholars have described dance in terms of religion. Kraus describes it among the ancients as being used “as a means of communication with the forces of nature – for becoming one with the gods,” and as “a major form of religious ritual . . . a means of worship”1. Curt Sachs tells us that dance was a way to “bridge the chasm between this and the other world” of the Gods2. Ellfeldt states that there is no primitive group in the world that does not have a strong ceremonial culture, and very few of these ceremonies that do not have dances associated with them3. Why do we not know more about these ritual dances? With the Egyptians, Ellfeldt tells us that it is because of the extreme secrecy “with which the priests guarded their dances . . . transmitting their rules by word of mouth”4. These dances were sacred, deeply symbolic rituals which were purposefully kept esoteric, only revealed to those “initiates” which participated in them. 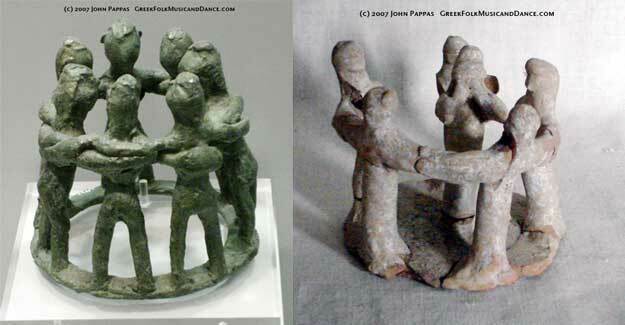 Most of these ancient dances have a general theme of the creation of the world. The histories of many prehistoric people display a rich assortment of myths dealing with life and death, but the myths of creation are definitely the most abundant and the most similar between cultures5. After studying the rituals of the world, Lord Raglan theorized that the original act from which the others evolved is the dramatization of the creation of the world6. The Aborigines tell us that their dances “were established in the beginning and handed down from father to son”7. They also make mention that they believe their tribal dances were received from the spirit world at the time of creation8. “chief medium of religious expression. The secret doctrines and mysteries of Egyptian mythology . . . were portrayed through symbolic dance dramas . . . and all this ‘was re-enacted constantly within the temples in dramatic dance form‘”10. Kraus notes that in many ancient cultures the myths were acted out, often with the theme of a battle between good and evil, life and death11. Nibley notes that the Acts of John says that the circle was in motion, a sort of dance17. Again he states that, “Were it not for a violent prejudice against dancing, the long debates of the scholars as to whether the participants in the prayer circle really danced or not would be pointless, since the earliest texts clearly say they did dance”18. What kind of dance? Nibley paraphrases Philo’s writing that, “men and women in the circle, following the lead of an exarchos or choral instructor, would chant hymns with antiphonal responses in a manner resembling both the ‘rapt enthusiasm’ and the circular motion of ancient choric dances, ‘hands and feet keeping time in accompaniment'”19. Augustine describes it as “hand in hand, with chant and responses, stamping of feet with occasional interruptions for hand-clapping – probably on the occasion of the Amen responses”20. In Stromata, Clement informs us that the initiates raised their hands in prayer during the dance: “So also we raise the head and lift the hands to heaven, and set the feet in motion at the closing utterance of the prayer”21. I enjoy all the parallels and similarities but I’m not so sure it points to a one time transfer or teaching of a certain pattern. I think dancing in a circle while holding hands is as natural as can be. If you removed all references to round dances in the entire world and a new generation grew up on a clean slate of cultural influence I think you would see round dances reemerge quite readily on playgrounds. I think there is something intrinsically unifying about the posture of gathering in a circle facing inward and that that posture is very natural for a group of social beings. I think taking that natural behavior and putting it in the context of cosmic movements, temples, altars, dance etc. is what makes it beautiful and so rich. So, I guess you would agree then that there is something more meaningful and fundamental in round dancing than the superficial act itself. There is something that draws us to round dancing, to take that position, and to follow that pattern. The circle itself, and circular structure and motion, naturally has connections with the cosmos, or in other words, religion. Although I do believe that the more formal patterns that are nearly identical in form and particularly geared towards divine worship, and are found in disparate and detached cultures and times, are more than mere coincidence or natural urge. There is something more going on than just instinct for the same ritual motif to show up in so many places. Another point I might make is that these things did not have to come from one particular source in time. As Latter-day Saints we believe that there have been a number of dispensations since Adam when God has revealed His gospel pattern to man on earth, and during which the same ritual pattern may have been revealed and reinstituted. This in addition to light and truth which God bestows upon all man on earth according to their wants and desires to follow Him. P.S. I didn’t have the last part 6 linked at the end of the article. I have fixed that now.